If you know me, you know I love beer. There is no way I could spend time in Eugene, Oregon and not go to Ninkasi Brewing Company. There was a lot of beer to be had in Oregon, and this is really the only brewery that stood out as truly amazing compared to what I can get home in Louisville. Named for the Sumerian goddess of beer (that was a Gus Bus Trivia question one time) they really live up to the calling of their craft. One of the AirBNBs we stayed at was only a few blocks from Ninkasi, so we delayed our trip until then. It just so happened that night was also their first tapping of Maiden the Shade, a summer seasonal IPA. So it was a packed house. I snapped a few pictures, but mostly there was a lot of people and waiting in lines. Maiden the Shade was very good. But my absolute favorite was the Tricerahops Double IPA. I’m not sure I’ve ever had a beer I liked better. I also tried the Quantum Pale Ale. For dinner we had the Sporkasbord platter (pictured above), Pad Thai, and a rice bowl with Pot Stickers from the Sporks A La Carte food cart. My favorites were the “mooinks,” bacon-wrapped meatballs, part of the sporkasbord. 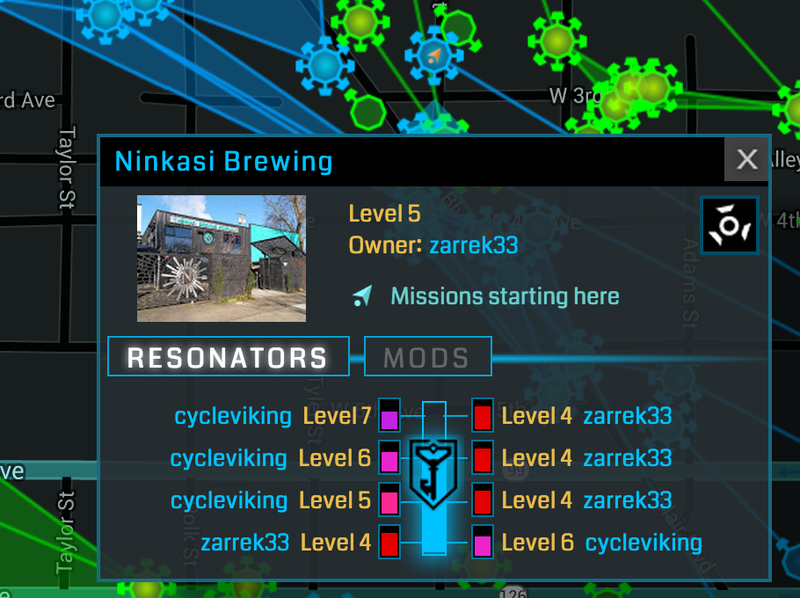 Ber and I also got into a tiny Ingress battle over the tasting room’s portal while we were there. We held our turf well. As of this writing, we actually still own it!